Enable Reeves to make the leap from actor to respected film director. Propel Reeves’ friend and Matrix kung fu mentor Tiger Chen to his own breakout as an action star. Establish a China beachhead for Reeves and enable him to make more movies there. Earn lots of money for the film’s investors, who include China Film Group, Wanda Media, Village Roadshow Pictures Asia, and Universal Pictures. But the tepid audience response to Man of Tai Chi’s opening in China last weekend spells disappointment for everyone involved. Although Reeves may still have a directing career ahead, his first film now appears more hindrance than help in advancing him toward that goal. I haven’t yet seen the movie so I can’t comment on Reeves’ directing capabilities, but the trailer has an odd direct-to-video feel to it and, according to Weibo chatter, lacks appeal for many in its targeted demographic. At a reported $25 million budget, the picture will need to do a much better job drawing audiences in the U.S. and other territories if it is to turn a profit. Wanda is said to have put up a substantial percentage of the negative cost in exchange for Chinese distribution rights, and turned over some 60 percent of its 1000+ screens to the picture. 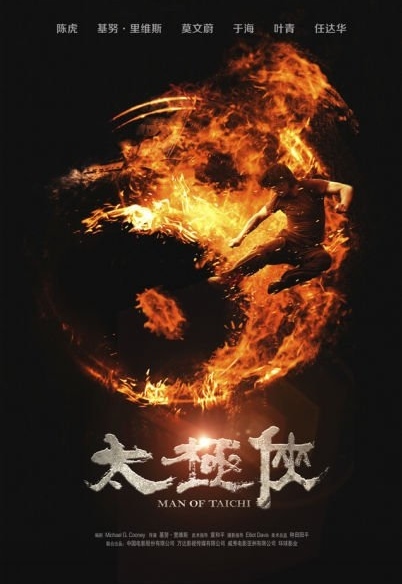 In hindsight that looks to have been a costly decision; given its $2.87 million nationwide total for the 3-day weekend, Man of Tai Chi will likely finish with less than $10 million in theatrical gross receipts over its entire China run. Wanda would have been better off allocating more of its screens to local hits Blind Detective and Tiny Times, or to the popular Warner Bros release Man of Steel. Wanda and its partners in Man of Tai Chi made a bet that audiences would turn out for Reeves because of his Chinese heritage and his track record as an action star with a genuine martial arts pedigree. My feeling is that the core moviegoing audience may simply be too young to know who Reeves is, and so he didn’t draw as well as had been hoped. The U.S. market probably won’t offer much support, as the film still doesn’t have a scheduled release date there. According to The Hollywood Reporter, Weinstein Company’s Radius division picked up U.S. rights at Cannes with intentions for a fourth quarter U.S. release, but has not yet announced any firm plans. Universal’s decision not to handle the film despite having invested in it suggests they lack confidence in its North American prospects. In Reeves’ and his backers’ defense, their task was not an easy one; few recent action or martial arts films have been successful both in China and abroad. Here’s hoping Man of Tai Chi finds better luck in the global market. This entry was posted in General News, Opinion and tagged Blind Detective, China Film Group, Hollywood Reporter, Keanu Reeves, Man of Steel, Man of Tai Chi, Matrix, Radius, Rob Cain, Robert Cain, Tiger Chen, Tiny TImes, Universal Pictures, Village Roadshow Pictures Asia, Wanda Group, Warner Bros, Weinstein Company by chinafilmbiz. Bookmark the permalink. The Hollywood Reporter’s numbers are wrong by a factor of 10. Man of Tai Chi‘s weekend total was just under US $2.9 million, as I reported. I’ve liked many of the films which Reeves has done. I’ll probably see the film when it arrives in the US. I wonder of the difficulties relate to the script but given the long development process, perhaps not. I agree with you concerning the casting, and this film was a vehicle for Tiger but when I met him on the set of Kung Fu Man to discuss another project for him I felt a need to bump up his star appeal as well. In the project we developed as another possible film for Tiger, we specifically put in a scene that he gets a haircut! Tiger’s a nice guy and I’m looking forward to seeing him save Arman Darbo, the young French actor, in Kung Fu Man! Thanks for your comments, Ryan. Best of luck with your projects. Sorry for previous email… today I checked Hollywood Reporter’s latest article and they have corrected the information they publicized yesterday to coincide what you have… $2.9M on opening weekend. That was kind of embarrassing for THR, no? I agree with your observation that the core movie going audience in China might not know who Keanu is, however, I think that has little weight on whether or not the movie has an appeal to the younger audience or not. I’m curious how this plays out, kindly keep us updated Rob, THR should probably tune in to your blog too! The investment proposition for Man of Tai Chi was heavily predicated on the belief that Keanu would be a major draw for the Chinese audience. A pity that it didn’t work out that way.